PATH OF BLOOD is an amazing documentary about Islamic terrorist attacks in Saudi Arabia after 9/11, which eventually are stopped by the Saudi government after many years. Award-winning Producer/Director Jonathan Hacker obtained incredible footage shot by the jihadists themselves of their training camps from the Saudi security services, but extreme caution is advised because of some extreme violence and bloodshed. PATH OF BLOOD is an amazing documentary about Islamic terrorist attacks in Saudi Arabia after 9/11, which eventually are stopped by the Saudi government after many years. Award-winning Producer/Director Jonathan Hacker obtained incredible footage from the Saudi security services searches shot by the Islamic jihadists themselves of their training camps. The movie, which is based on Hacker’s book by the same title, opens with a group of jihadis praising one of their members for driving the car that blew him and perhaps a small part of the American compound to smithereens. The gullible Muslim extremist Ali seems completely confused by the questions the videographer asks him and about the role he’s talking in global jihad. In most of the captured jihadi video, the same story is told time and time again in a fascinating way, that the jihadis themselves were confused and ignorant. In the beginning, they have some shocking victories that kill Muslims and Americans in Saudi Arabia. However, slowly but surely, the Saudi security services find the cells and eliminate them one after the other with extreme fighting, sometimes destroying whole buildings in Riyadh, the capital city, to get the jihadists. Eventually, the jihadists associated with al-Qaeda are driven from Saudi Arabia. Although the facts of history are known, this documentary gives an incredible, behind-the-scene look at the terrorists themselves. It also shows the valor of the Saudi security services. The security services decide, in a very casual classroom setting, to help the captured jihadists understand a more peaceful view of their religion. Thus, the movie, though frightening and ultraviolent, shows a ray of hope. Some of PATH OF BLOOD is extremely hard to watch, such as an American businessman who’s captured and eventually beheaded. Also, the preparations to meet and kill the head of the Saudi security forces in his own room, thus getting past layers and layers of security, are amazing, but also frightening. Because of the violence and bloodshed, PATH OF BLOOD isn’t a movie for sensitive viewers. Because of the exposé of Islamic terrorism, it is a must-see documentary for everyone else. Very impassioned imams call for jihad, which could confuse susceptible people. 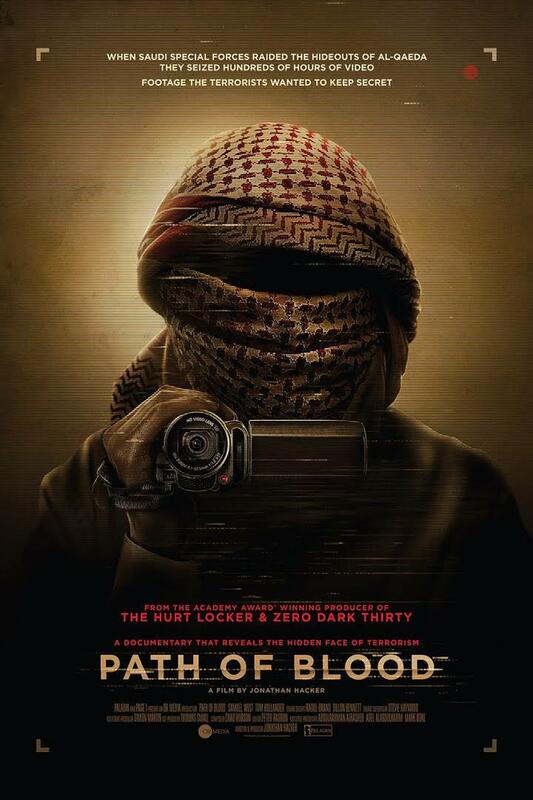 PATH OF BLOOD is an amazing documentary about Islamic terrorist attacks in Saudi Arabia after 9/11. Award-winning Producer/Director Jonathan Hacker obtained incredible footage shot by the jihadists themselves of their training camps. In most of the video captured by the Saudi government, the same story is told again and again in a fascinating way, that the jihadis themselves were confused and ignorant. In the beginning, they have some shocking victories killing Muslims and Americans. However, slowly but surely, the Saudi security services find the cells and eliminate them after extreme fighting. Although the historical facts are known, this documentary gives a behind-the-scenes look at the terrorists themselves. It also shows the valor of the Saudi security services, who try to help the captured jihadis understand a more peaceful view of their religion. Thus, the movie, though frightening and ultraviolent, shows an ray of hope. Some of the movie is extremely hard to watch. Because of the violence and bloodshed, PATH OF BLOOD isn’t a movie for sensitive viewers. Because of the exposé of Islamic terrorism, it is a must-see documentary for everyone else.